Jess: I give him a lot of credit. I'm not easy to get along with. Still, here he is: pancakes and bad jokes. I'm not clinically diagnosed with anxiety or anything, but relatability doesn't always require exactness - I guess we all have had an experience like Jessica's before: the failure, the anger that comes with lashing out at someone, and the embarrassment and guilt that follow. That alone, and emotional beats alone, won't bring a show success. 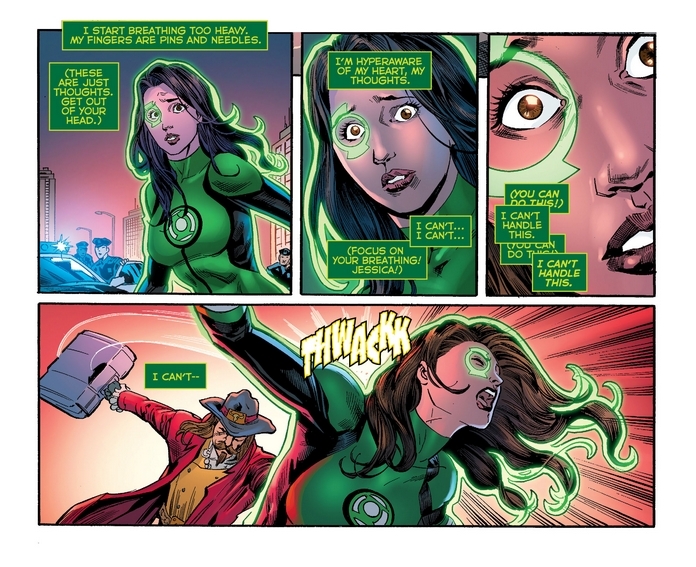 But assuming they do pick up Green Lantern for TV (because what're they doing with it, anyway?) this issue is a prime example of how to cover it: as a journey towards becoming someone with the courage to be there for your friends, and to be someone worthy of friends who'll be there for you. Something Wonder Woman next, after maybe a Titans post. Stay tuned! 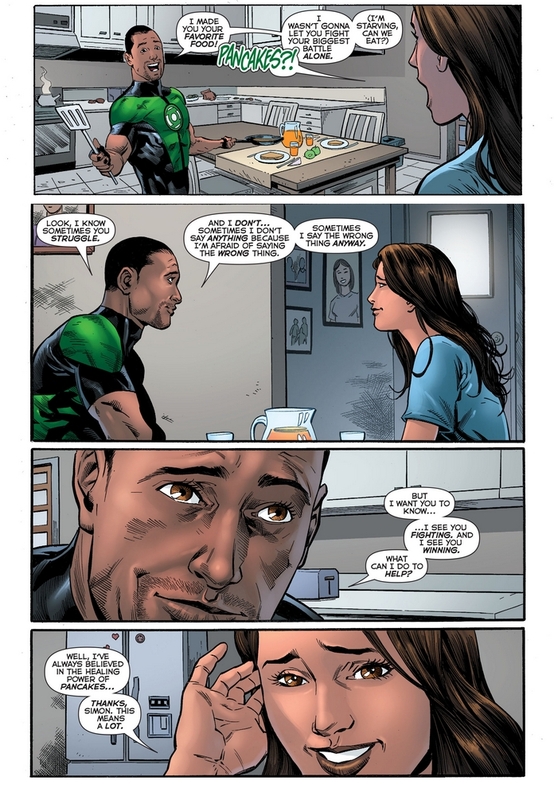 Simon and Jessica MIGHT work for a TV show if we give the idea Hal Jordan is busy with his whole sector but wants someone to cover Earth. The first X-Men movie makes a great TV pilot. There were some big special effects and setpieces, but most of it you could see being done on a weekly basis (Wolvie would probably mostly pop his claws just offscreen, Mystique would probably spend a lot of time as other people), and the story ended with several plot threads dangling, just waiting to become the meat and potatoes of a season 1 arc. 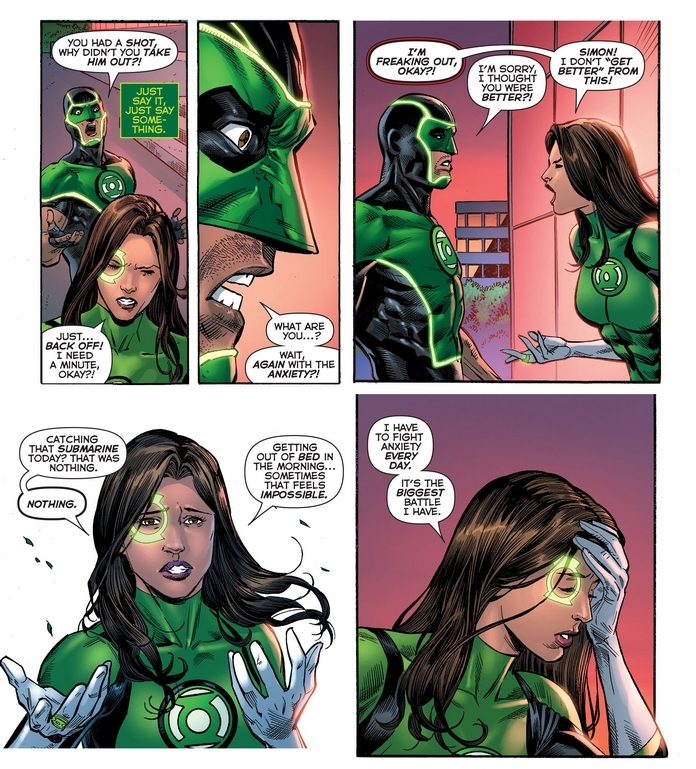 I was thinking it would have to be this (which I think is the current situation with Simon and Jess) or a 'The OG Lanterns / GLC are missing after winning some heavy conflict'. I'd rather it was animation over live action. Too many live actions shows on CW always fall back to street level martial arts or depower them heavily. And often they don't have the budget to live up their own hype. You're promised a city-wide invasion by an army of gorillas, and you get a battle against two of them. 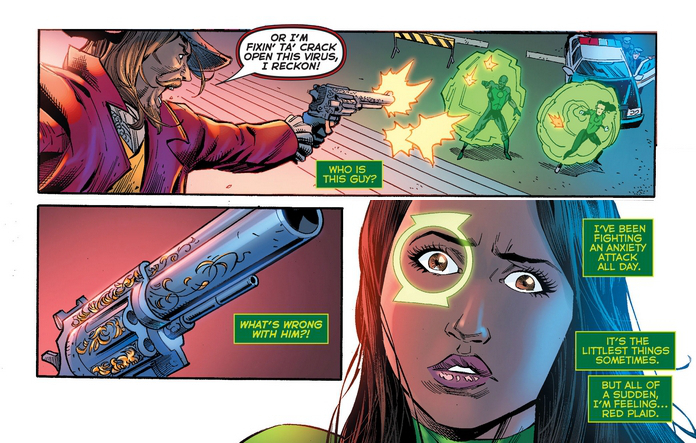 As to the complaint of lack of color, seeing how CW is incapable of writing a superpowers show just do another generic street level show Renee Montoya The Question. Leave the superpowered action shows in animation where imagination can go loose without the restrictions of props and CG. 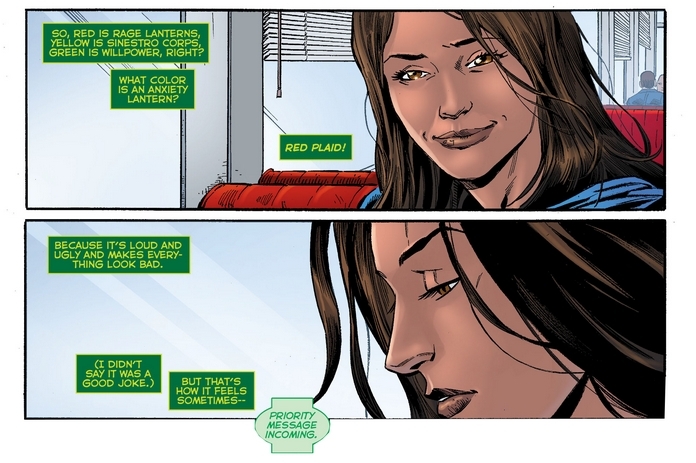 Also can I just say I adore how DC has handled Jessica? It's nice to have a superhero with a mental disorder who isn't portrayed as "crazy" or with multiple personalities. I'm sure she's not the first character like that, but she's the first I've experienced personally, and I really appreciate the effort they put into making her struggles accurate. It's nice to have a superhero with a mental disorder who isn't portrayed as "crazy" or with multiple personalities... I really appreciate the effort they put into making her struggles accurate. Now that you mention it, yeah. No one really comes to mind. 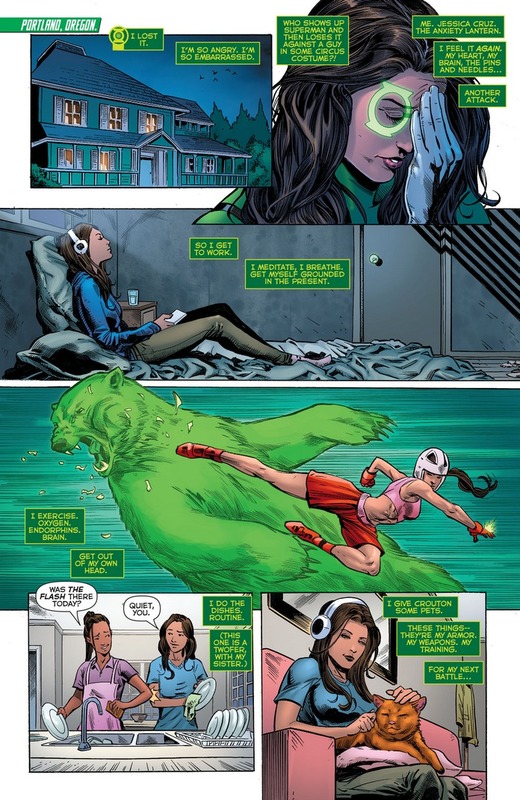 I remember reading an article on CBR about writing anxiety in comics and this book got a nod (as well as Silk, from Marvel, if I remember right). Ah, the Question! 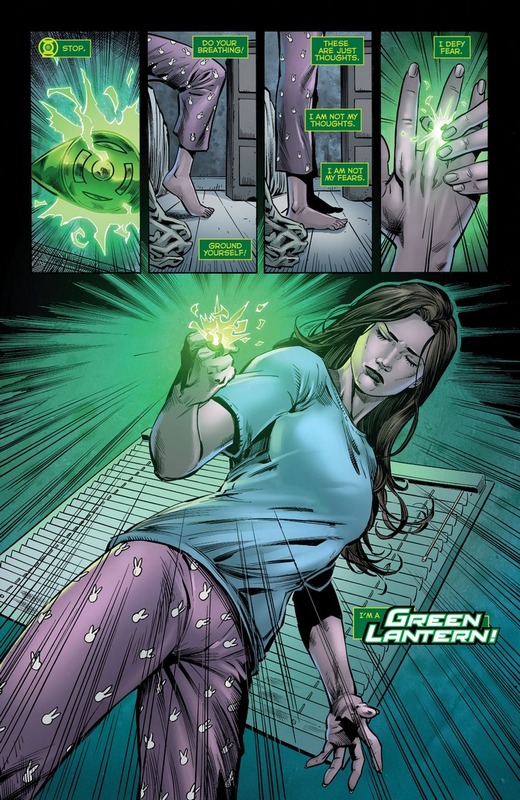 I've got some personal caveats on how she should be implemented (something about Kate Kane, Maggie Sawyer, Vic Sage, and picking up lessons learned from Arrow), and I for one am still pushing on this Green Lanterns team on the small screen, but yeah, that could also work. Maybe put Rucka on the writing team, the way Flash occasionally enlists Geoff Johns. Y'know, I was never a fan of Maggie Sawer moving to Gotham it just felt like such a step down for her career wise given how she's faced far worse in Metropolis. That and I feel the Superman mythos was cheated from yet another supporting character being taken away or non existence. Hey, I won't argue with that - especially with CW!Sawyer already in place in CW's Super-'family'. Just that I've got some personal checks-and-balances on how to integrate Renee Montoya and any of her possible character interactions in the DCTV-verse. I remember there was a Green Lantern animated series recently, although I haven't watched it enough to declare how good it was. It was...... adequate, but the Bruce Timm style just could not transcend to the CG animation frontier making everything blocky. I'm just waiting for something more with hand drawn or even flash if animated well. Ah, so it is! That's why I'm still gunning for a live-action adaptation, with cumulative increases in powers to match the (theoretical) seasonal increases in budget. 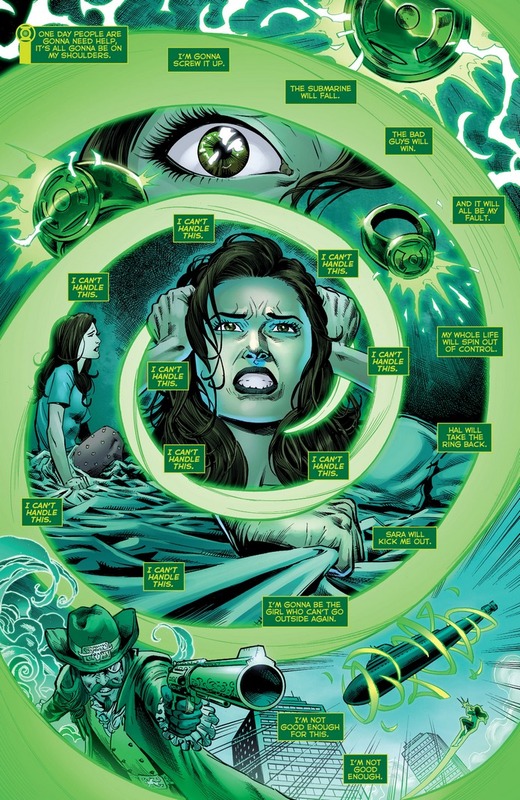 That image with her spiral thoughts gets pretty close to how my own anxiety is. The overthinking that circles your brain and that spirals out of control until you find something to either distract or ground yourself. The overthinking that circles your brain and that spirals out of control until you find something to either distract or ground yourself. Oh, so that one has kind of a basis, that's interesting! I don't know if I can imagine how you must feel at those times, but in any case, I wish you well on your continued battle. Thank you for this, I wasn't aware of this comic before now. Would you reccommend this book? You're welcome! 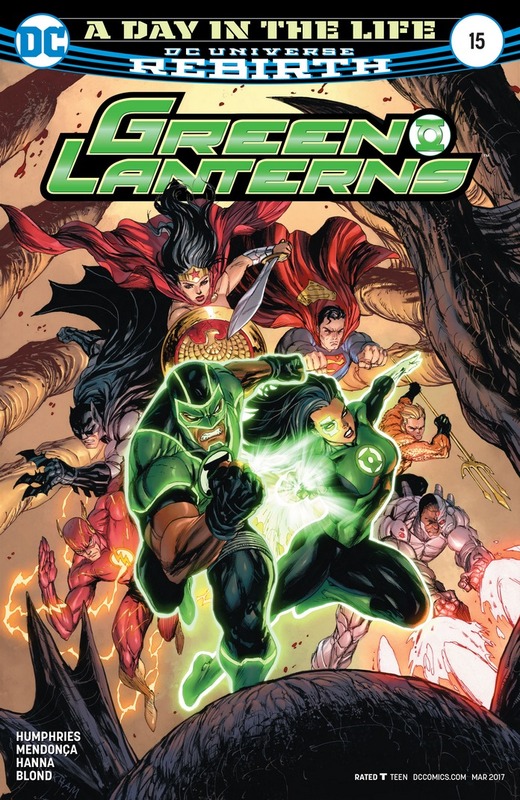 I recommend this for the character interactions, not just between our heroes but for supporting characters (Baz and Cruz' family) and villains (Dr. Polaris, that Phantom Lantern guy) too. You may be jarred out of the reading high by the occasional plot holes, but in general there's way more stuff that works than stuff that doesn't. Crouton? she has a cat named Crouton? Why is DC comics giving cats stupid names? First Lotion, and now Crouton. It's mandate ever since they implemented the Dex-Starr Act of 2008. Also, I actually am impressed you know the cat from Doom Patrol. Agreed, I like this because of its ' the value of the struggle' thing - in any case, there's different but present value to be found in both stories. I'm glad you liked it! I probably laughed harder than I should have at "Whitest Day," though. If that's bad, then I really do apologize. But that was good. Hey, I share your sentiment! But that jab isn't without truth, y'know? Just a lighthearted call for improvement.